This course is 1 hour from Mesquite in the Mountain time zone and 1 hour ahead of Mesquite time. The Sand Hollow Resort Golf Club boasts 27 scenic holes designed by respected golf course architect John Fought. The course blends with the natural landscape, winding among sand dunes and stands of red rock. It features an 18-hole championship course and a nine-hole walking course. In addition to the adjacent dunes and rock outcroppings, the course provides golfers with stunning views of the peaks of the Pine Valley Mountains. Sand Hollows' 26,000-square-foot, full-service clubhouse overlooks holes 9 and 18 of the championship course. 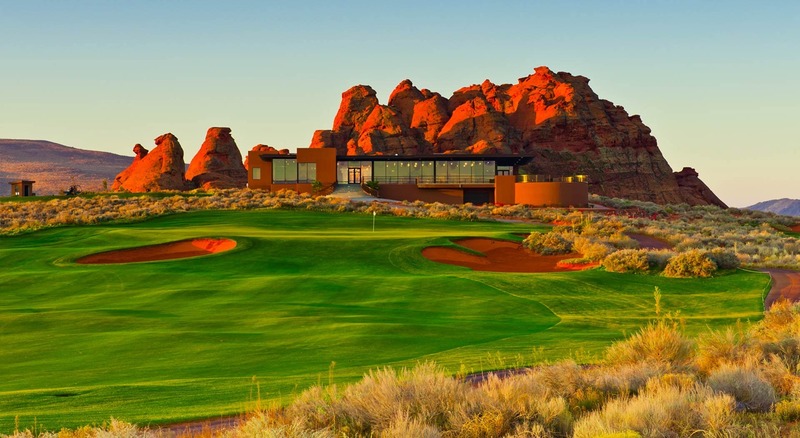 Nestled next to a red rock mountain, the clubhouse features a pro shop and banquet rooms as well as a restaurant offering patio dining, an exceptionally picturesque setting.